Well we feel like we are just super lucky. To begin with I want to say how lucky I feel to have found the page. I was searching on google for rescue sites for Cavs and your's popped up. And on the first time we visited the site we saw the posting about Hannah and how she was three years old and in great health and already potty trained plus she, like many Cavs, is a great family pet happy with kids and adults and other dogs. Plus she is a purebred Cav which was something we were looking for because we read about the breed and like the breed so much. Moreover, Hannah is the perfect dog for first time dog owners so everything has worked out so well. 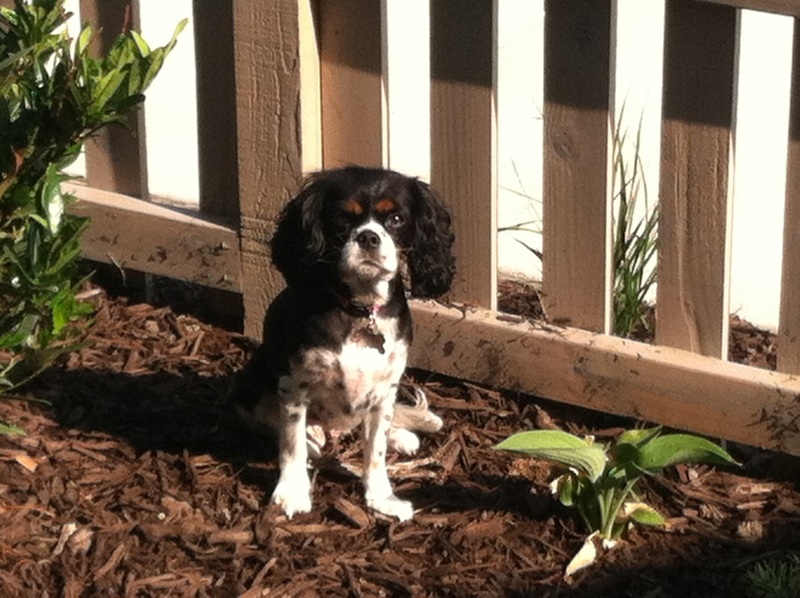 Plus, Hannah was the closest dog to us in Denver on any of the Cav Rescue sites that we found on the internet. So we feel very lucky--it was perfect timing. When we first picked her up she was a little shy but by that same night she bonded with us immediately. Now she is totally part of the family. We go for daily walks when it is nice. Sometimes we go for bike rides and she follows along on her leash. We have taken her hiking a few times. She loves being outside and going places with us. She sleeps in our bed with us and keeps us warm. She is a real joy to have. What was really great too was that Crazy Cavaliers is totally committed to helping Cavs find forever homes and you can tell this by the whole adoption process. We also saw firsthand the love that they have for these dogs because they host play groups for Cavs and when we went to pick up Hannah there must have been like 12 other Cavs present all running and playing happily in the yard. As I mentioned earlier we feel very lucky to have found Hannah and to have found her through this organization. 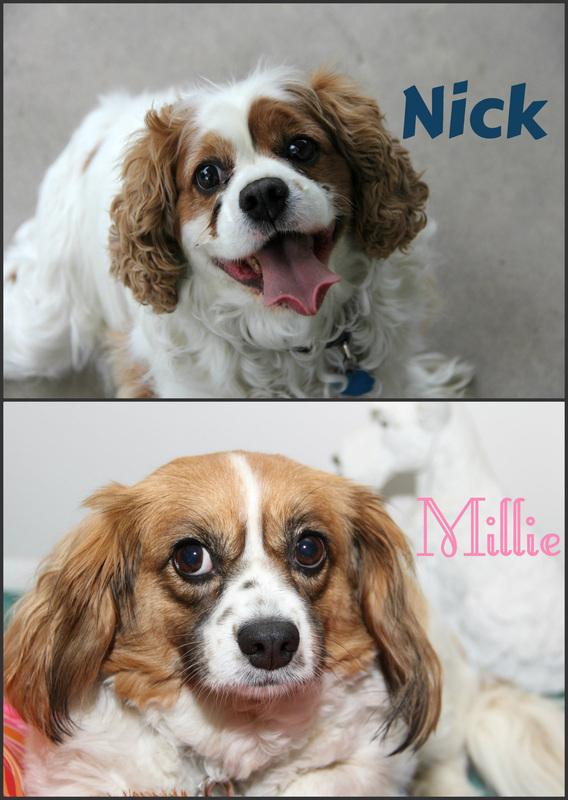 We have had the pleasure of adopting not one but two wonderful dogs from Cavalier Crazy Rescue. This is a rescue that not only saves dogs but families as well. Our Nick is a fantastic addition to our family, he is cute, well mannered, and very much loved by us. Millie is so sweet, it is hard to believe she ever ended up in rescue, but we are glad she did. Neither of these dogs are puppies, rather they are both older dogs who are perfect for our home. Giving an older dog a home not only fulfills the dogs needs but ours as well. The rescue was diligent in seeing to the medical needs of these dogs. Their founder is a very pleasant person who knows how to match dogs to families. She is very organized, professional, and truly cares about the welfare of the animals. Words don't express the gratitude we feel for the work she did to connect us to the perfect dogs. We want to thank Cavalier Rescue for her dedication to rescuing these amazing little dogs and matching them up with loving families. 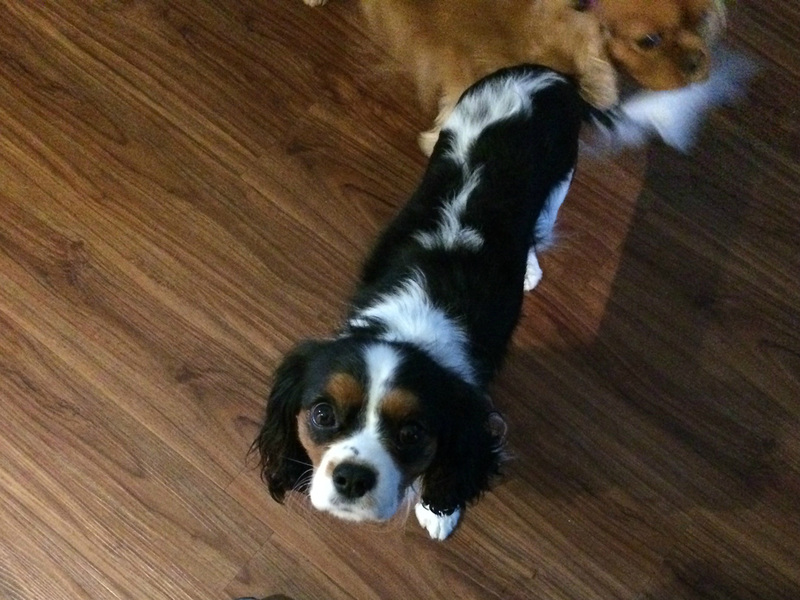 We had originally contacted her for a tri-color rescue but when she suggested we meet Cheena who is a black and tan Cavalier, and we immediately feel in love with this little one. She truly belongs in our family and our other 2 cavaliers were so welcoming to her. They are all so sweet together and Cheena is now enjoying the love and attention she deserves. We would recommend to anyone looking for a Cavalier, to contact Cavalier Rescue. It is truly a rewarding experience. I found Cavalier Crazy's website online, and was so excited. From the beginning, the entire process was a breeze. At the time, there weren't any rescue pups available, but there were instructions to email to request an application. I quickly received my application and filled it out, and got a response that they would be receiving some new dogs soon. I was nervous about the home visit-and expected some judgey lady who would point out the dirt in the corner of my house or something, and tell me that I didn't deserve a dog. That was nonsense though-she was so friendly and nice. She brought over a couple of dogs that she thought might be good for our family. We were told that we could keep the dog for a week to see how things went, and could return her if we needed to-no questions asked. That was such a load off for me, because I was a first time dog owner. I didn't know what to expect, and I was also so worried about my cat having problems with the new family member. Everything turned out so wonderfully! We are so blessed to have Stella with us. I work from home 4 days a week and she's by my side like a siamese twin. After the cat threw a 1 month tantrum-they are now civil and live in peace. We like to throw toys around the house for Stella to fetch and I take her everywhere I can. Most importantly for me-I was able to email questions about her, and she always quickly responded. I'm always trying to talk my husband into getting another dog-and once I do, I wouldn't get a Cavalier from anywhere else. Thanks so much for all your great work! How do I even begin to express to you how much Jackson means to us? He has brought so much love and life to our home. Although it makes me sad to know that he didn't have the most stable first two years of his life, I'm so thankful for the opportunity to be his forever mommy and give him a lifetime of unconditional love. We have developed such a precious bond. He's my bright ray of sunshine and devoted companion. He was a little shy at first, but it didn't take long for him to blossom into a confident and outgoing boy. He fits in perfectly with our family. His three fur-brothers love him so much. I can't explain it, but there's just something extra special about Jackson. We are so grateful that you brought us together and for an incredibly pleasant adoption experience. Thank you for staying in touch with us. I feel like we've made a friend for life. We have been a family of cavalier lovers for the past 25 years after living in France and observing so many sweet cavaliers in tiny shops with the shopkeepers all day long - they were so friendly and quiet and well-behaved! When we returned to the US, we were living in a suburb of Detroit and discovered on of the top cavalier breeders in the US lived minutes away! That first year, we got two Blenheims and were on our way to a life of love! 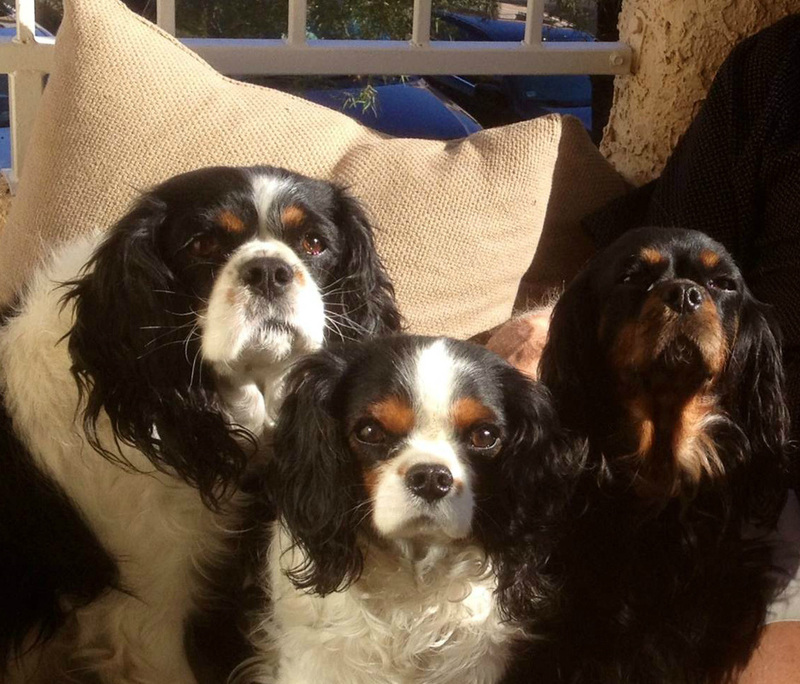 Our careers keep us moving every few years and our growing brood of 7 cavaliers moved with us every step of the way. In 2009 we found ourselves living in Salt Lake City where we rescued our first 'Ruby' who had been abused by her previous owner's husband. 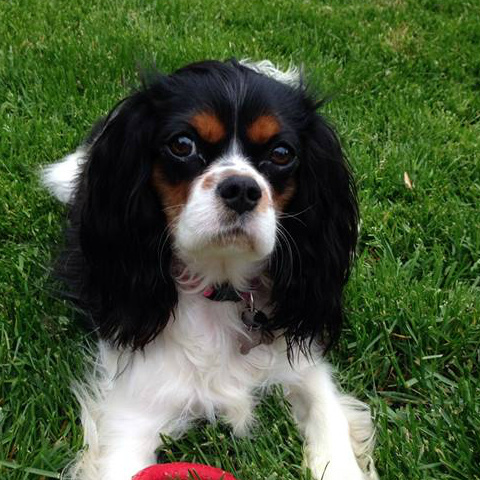 At that time there was no formal rescue for cavaliers in Utah. So, we reached out to cavalier rescues in California, Colorado, New Mexico and Arizona - often finding cavaliers for many of our friends and relatives who had fallen in love with our cavs but couldn't afford to purchase one from a reputable breeder. Earlier this year, we received information about the Utah cavalier rescue and the work that they have done here. We immediately found an opportunity to bring Remi into our home. The whole experience was great! He had some challenges due to his prior living conditions and being in 6 homes before he was 16 months old but he quickly adapted and he fits in perfectly with his cavalier and pug siblings! 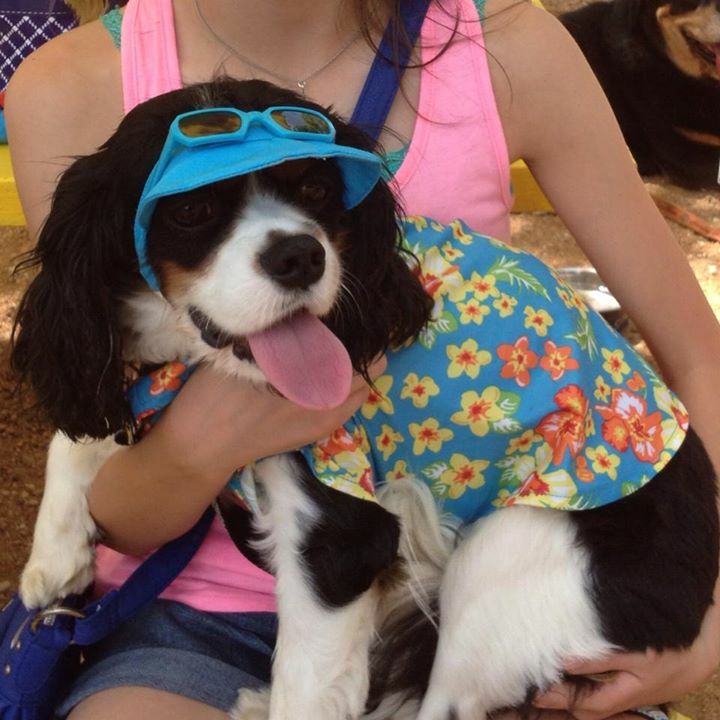 We would highly recommend Cavalier Crazy Rescue to anyone considering adoption! After our companion Sensei passed away from a long illness at almost 15 years old, I was not in a hurry to fall in love again with another furever friend. But, fate had a surprise for us. Cavalier crazy Rescue needed help fostering a new puppy that was rescued from being sold on the internet. The new owners couldn't handle a puppy so they kept her in a crate for 6 months. I offered to foster her until they found the best home for her. My other Cavalier, Riley, was sad at the passing of his "brother" so I figured this would be the best for all of us. It also gave me the opportunity to help a worthy organization save another life. The foster process was diligent and thorough. I was happy to answer all the questions and open our home to the rescue group . The minute I laid eyes on my Pixie Lu, I knew she picked us and the stars were aligned! We started the adoption paperwork within 2 weeks! She helped us through our grief and she helped her brother too. Yes! As we recently discovered, they really are brother and sister ( same dad) and 5 years apart!!! So, I guess we all rescued each other and it couldn't be more perfect! Cavalier Crazy Rescue has saved so many lives. The organizer is so meticulous and thorough and goes over and beyond to make sure it's the best match for the pet and the family. I have become a strong supporter of adoption. So many of our furry friends need a new start for many different reasons. Our family is forever grateful to the rescue group for bringing Pixie Lu into our lives!